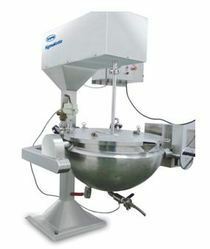 Providing you the best range of paste kettle, starch paste kettle, tilting paste kettle, motorized tilting paste kettle, stirrer paste kettle and steam heated paste kettle with effective & timely delivery. In order to fulfill the ever changing demands of our clients, we have been engaged in offering a quality range of Paste Kettle. Based on advance mechanism and made from fine grade material the machine is widely used for paste / binder preparation for RMG Process. Stainless steel is used for making all the contact and non-contact parts of the machines. The main drive of the equipment is provided with VFD for fine control of impeller speed. It is also provided with an inbuilt heat element jacket thus, providing with efficient working. 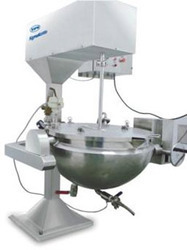 With thorough industry knowledge, we are engaged in manufacturing, supplying and exporting a wide range of Starch Paste Kettle used for paste / binder preparation for RMG process. Fine grade stainless steel is used in fabricating the machine ensuring the long service life and efficient working. Further, the kettle also has top drive with German make gear box making the working easier and defect free. Clients can avail these machines from us at market leading prices. 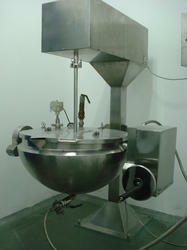 Paste Kettle used for preparation Paste for binding material which are used in medicine & food industries. Preparation of paste needs temperature for binding of material. Paste Kettle is with jacket to generate the temperature through steam or electrical heater. 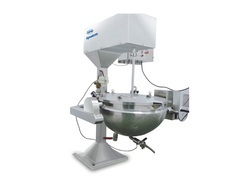 Kettle is with Anchor type impeller for mixing of paste. 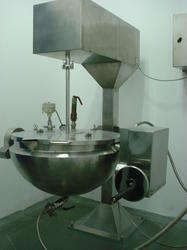 Tilting arrangement provide to discharge the paste. Looking for PASTE KETTLE ?